Over the past few weeks we’ve been looking at a letter that the apostle Paul wrote to the church in a place called Colossae. Although it was written nearly 2000 years ago, we have seen there is so much that this letter can teach us today, about the way the good news spreads and grows, about the way a leader should care for the church, and above all about the identity of Jesus Christ, whom Colossians 1:15 tells us is the image of the invisible God, the firstborn over all creation. And I very much hope that if you haven’t been here, you’ve caught up with the sermons online, or if not, will ask for a copy after the service. The one thing this letter doesn’t tell us, however, is how the church in Colossae received Paul’s letter. All that we know about Colossae is mentioned in this particular book of the New Testament, and we hear nothing about it anywhere else in the Bible. So when Paul’s messenger, a chap called Tychicus, turned up and read out the letter, we can only guess at the reaction. Did some walk out? Did some cheer and applaud? Were some completely distracted by the latest sporting news? We simply don’t know – only that someone somewhere decided it was worth keeping this letter, and for that we must all be profoundly grateful. 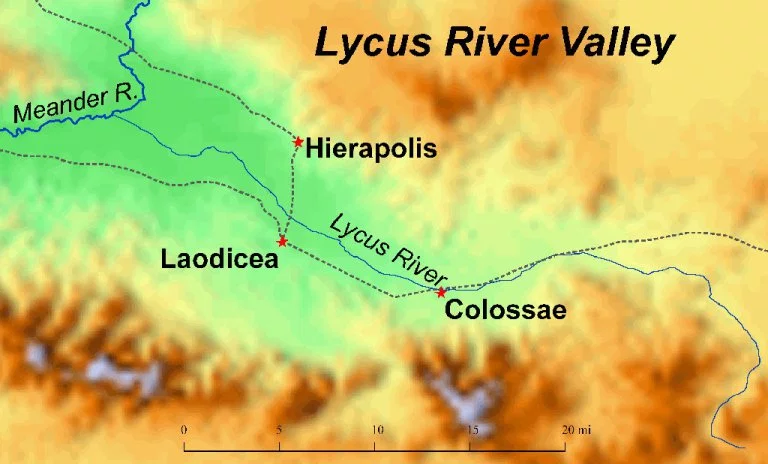 But we do know rather more about the sister church of the Colossians which was in a place called Laodicea about 10 miles along the valley on the banks of the Lycus River. This church was probably also founded by Paul’s fellow-worker Epaphras mentioned in Col 1:7 and we do know Paul considered the churches in Colossae and Laodicea as having some special connection. That’s why in Col 2:1 he tells his hearers: I want you to know how much I am struggling for you and for those at Laodicea and we learn later on from Col 4:16 that the letter Paul wrote to the Colossians was also to be read to the Laodiceans. In modern Church of England jargon, they were one mission community serving the same region with the one aim of making Jesus known. So what happened to the church in Laodicea? Well, if you were turn over to the book of Revelation, written perhaps a generation later, you will find these words in Revelation 3:14-16: To the angel of the church in Laodicea write: These are the words of the Amen, the faithful and true witness, the ruler of God’s creation. I know your deeds, that you are neither cold nor hot. I wish you were either one or the other! So, because you are lukewarm – neither hot nor cold – I am about to spit you out of my mouth. That’s a very different tone and a very different message from the warm words Paul wrote to the Colossian church. Jesus, the ruler of God’s creation, is issuing a stern warning of judgement against these believers who have over the years have become lukewarm and half-hearted in their faith. And I believe there is a real lesson for us that we can take away from the Lord’s warning to the Laodiceans. You see, in my experience the greatest danger to the Christian faith comes not from persecution or some sudden crisis of belief or even from the World Cup being on telly. It comes from people losing their first love for the Lord and growing lukewarm in the faith, maybe not in a way that’s obvious to anyone else, but slowly, gradually over the years, until actually following Jesus no longer really interests them. I have seen so many people fall away from the faith in this way, people who you thought were keen and committed, who start coming to church less and less, who find prayer and worship more and more of a duty rather than a joy, and in the end just drift away, their hearts and minds set on some new passion or desire. Colossians 2:6-7: So then, just as you received Christ Jesus as Lord, continue to live in Him, rooted and built up in Him, strengthened in the faith as you were taught, and overflowing with thankfulness. And the first and most important thing I want you to notice is that as is so often the case in the Bible is that Paul’s words are not addressed to individuals but to the church as a whole. One of my bugbears as a linguist is that the English language makes no distinction between “you plural” and “you singular”, so when we read words like this, we think Paul is just talking to me about my walk with God. Actually, as we’ve already seen in our journey through Colossians, our faith is not just about a relationship with Jesus Christ, but also about a relationship with each other. To live in Him means to live as part of His body, the church; to walk with Him means to walk alongside our fellow believers united by His Holy Spirit working in and among us. It really is so vital that we understand this. One of the greatest heresies of our age comes from those who say, “You don’t have to go to church to be a Christian.” That shows a total misunderstanding of the good news of Jesus Christ. Jesus came to save us in order that we might become part of His family, the church. The church is not an optional extra for the keen and committed but an integral part of what it means to follow Jesus as our Lord and Saviour. Indeed there is a profound connection between our commitment to the church and our commitment to Jesus Christ. If we are not supporting, encouraging, loving each other, then all of us will find it so much harder to live for Jesus Christ each day. For my part, I simply cannot imagine living each day without the knowledge others were praying for me, without the strength and support that our worship each Sunday gives me, without the fellowship of a small group upholding me. 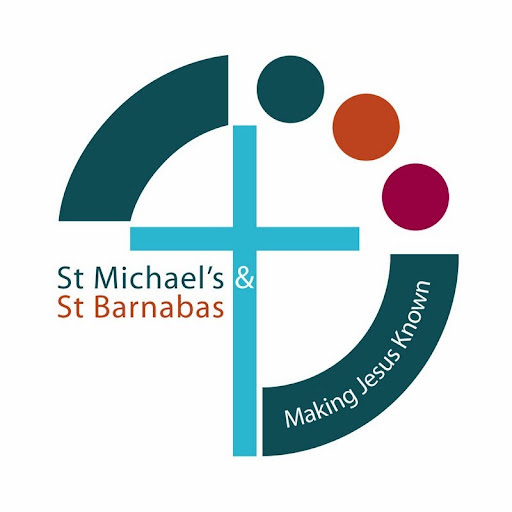 That’s why one very simple aim I have for St Barnacles I have is quite simply to see greater attendance by its members. This isn’t because I want some big recruitment drive or so I can boast of this being a big church. It is because I have a deep, deep concern for the spiritual welfare of each person who belongs to this congregation. Now I realise that today some have good reasons for not being here, and it is vital we love and support those who cannot get to church for whatever reason. But there are others who should be here, and we all need to pray and consider how to encourage them back. Now we don’t have time to look at these words in great detail, but I do want you to notice is how simple and how straightforward they are. So often we can make the whole business of church so complicated that we can easily put people off. Actually, says, Paul it’s really a matter of three things. First, it’s about holding on the faith that you have first received, and not letting go. Second, it’s about letting God doing His work in us and among us, so that by His Holy Spirit we are rooted, built up and strengthened. And thirdly, it’s about learning to see God at work in all circumstances and to thank Him for all that He is and all that He’s doing. And where those three things are happening, there the church is as Jesus intends it to be. Yet you know as well as I there are many churches who give every impression they have become as lukewarm as the Laodiceans, where the faith is no longer clearly taught, where there is no real love for the Lord, where joy in worship is often in short supply. Of course I realise it’s not for us to judge such churches, and you often find when you dig a little deeper, there are many faithful believers within their walls. But the question is, how do we make sure that we remain on track and live up to our identity as the church of Jesus Christ? First of all, says Paul, make sure you really are focused on Jesus. Verses 8-10: See to it that no-one takes you captive through hollow and deceptive philosophy, which depends on human tradition and the basic principles of this world rather than on Christ. For in Christ all the fullness of the Deity lives in bodily form, and you have been given fullness in Christ, who is the Head over every power and authority. Now you might ask, why would a church choose man-made philosophy rather than the full, glorious revelation of God in Jesus Christ? Simply for this reason – that human philosophy doesn’t challenge or threaten us. It’s about me and what works for me. It may borrow the language of the Christian faith, but essentially it is self-centred rather than God-centred. It promises blessings but ignores uncomfortable truths such as judgement or hell or repentance. Yet as Jesus reminds us in our reading we are not simply at liberty to cut out of the faith those parts we find unattractive or make us uncomfortable. Luke 9:23: If anyone would come after me, he must deny himself and take up his cross daily and follow me. That is not the wisdom of the world and it is not the path to a comfortable, cosy existence. However as Jesus makes clear that is the route to eternal life. If we are serious about continuing to live in Him, then we must be willing to do what He says, and not change or ignore the parts of the Christian faith we do not like. Secondly, says Paul, remember what Jesus has done for you. Verses 11-12: In him you were also circumcised, in the putting off of the sinful nature, not with a circumcision done by the hands of men but with the circumcision done by Christ, having been buried with him in baptism and raised with him through your faith in the power of God, who raised him from the dead. To us what Paul is saying here may at first glance seem quite obscure but what he is saying is massively important. In the Old Testament the way you showed you were a member of God’s people was – if you were a boy – through a symbolic act that stayed with you for the rest of your life. Each day your body would remind you of the decision you made or was made on your behalf. However with the coming of Christ the way you showed you were a member of God’s people changed completely. No longer did you undergo a physical operation. That could only serve as an outward reminder of your identity and it had no real power to change your life. Instead, when you confessed Jesus Christ as Lord, you were plunged down in the water in an act of baptism, which to Paul, was as close as possible as you could get to sharing in the actual burial of Jesus. And just as Jesus’ earthly body was put to death and placed in a tomb, so in this moment of confession, you put to death your old nature. You said no to living for yourself, no to following your own desires, no to being ruled by sin. And the moment you were pulled out of the water, you were saying yes to living for Christ, yes to sharing in His resurrection life, yes to being filled with His Holy Spirit. Now some of us here can remember our baptism, some of us cannot. That however is beside the point. What we should all be able to do is remember is a time when we realised we had come to faith in Jesus Christ – maybe through a sudden decision, maybe over a process of years. And we would all do well to continually remember the difference that our faith makes, to recall how much our lives were transformed by the grace and mercy of Jesus Christ. Because when you understand and are truly thankful for what Jesus has done for you, that’s when your love for Him grows and deepens. That’s why as believers we need to come back to the cross again and again, to realise afresh that despite all our sin, all our failings, we have been raised to new life with Jesus and that nothing I think or feel or do can alter this wonderful new relationship which has been secured once for all by His death for us. So before I go any further, let me just ask you – when was the last time you thought about the cross of Christ? Can you look back on a time when you realised the difference that faith in Jesus made? If not, then today I would urge you to think just what it means to say that Jesus died for you and that you have been raised to new life with Him. And as you go back to the cross, Paul says, thirdly, remember the victory Jesus has won for you. When you were dead in your sins and in the uncircumcision of your sinful nature, God made you alive with Christ. He forgave us all our sins, having cancelled the written code, with its regulations, that was against us and that stood opposed to us; he took it away, nailing it to the cross. And having disarmed the powers and authorities, he made a public spectacle of them, triumphing over them by the cross. All the way through this passage Paul takes it for granted we are in a spiritual battle. To be a follower of Christ necessarily involves coming up against powers and authorities that want to be Lord over this world of ours, and over our lives. We may not be that comfortable with the idea of a spiritual battle, but it is a reality of the Christian life we need to own and recognise. Now when we think of a spiritual battle we tend to think of direct attack or persecution, and there is no doubt that sometimes the conflict does indeed take that form. But the spiritual battle can take other forms. For example, what is this written code Paul talks about here? Simply this, that it is the charge sheet of all our sin and shame which separates us from the love of God. You see, the one thing the evil one would want us to believe above all else is that there is something we have thought or said or done that cannot be forgiven. He would far rather that we were a prisoner of our own guilty conscience than a free child of God. Yet what did Jesus do for us on the cross? Paul tells us in verse 13: He forgave us all our sins – not just the ones we thought could be forgiven, the small ones that aren’t really that important or the ones that no-one else notices. No, Jesus forgave us every single sin. He forgave you every single sin. So although we do indeed need to repent of what we have done wrong, there is no need to be condemned by our guilt or our sense of worthlessness. Jesus has already borne the penalty of our wrongdoing and taken the judgement that should be ours. The next time you hear that little voice accusing you or telling you you are not worthy of God’s love and care remember – Jesus has already won the victory for you on the cross. Those spiritual forces that seem so powerfully lined up against you – they have been defeated. And again, if we are to be the church that continues to live in Christ, we need to live in that victory and show the power of His forgiveness in our life one with another. So Paul tells us – make sure you are focused on Jesus; remember what Jesus has done for you; and remember the victory He has won for you. Sounds simple? It should be. Yet what are so often the biggest concerns of the church? Well, I’ve leave you to answer that question for yourself. All I will say is that so often Jesus and the cross seem almost out of sight when you look at the agenda of many synods, councils and meetings. That’s why, finally, we need to heed Paul’s warning in verses 16-17: Don’t get hung up on the details. Of course we need order in the church. Of course we need traditions and a certain way of doing things. But the reality is found in Christ. If traditions become more important than the gospel, or the way we have always done things means that we quench the work of the Holy Spirit, then we are in trouble. The reality is found in Christ. And as Paul goes on to say, the problem with holding on to human traditions and observing lots of rules and regulations is that it allows pride to take root and contaminate our faith, as if somehow by our own efforts we can become a better Christian or a more respectable kind of church. Maybe the root issue that we face is that too often we forget whose church it is. We tend to think of the church as my church or our church as if it should run according to our agenda. But as the alternative translation of verse 17 puts it, the body, however, is of Christ. So our calling as the church of Christ is live according to Christ’s agenda, and not to let our love for Him grow cold. Let’s make sure we are focused on Jesus. Let’s remember what Jesus has done for us. Let’s remember the victory He has won for us. And let’s not get hung up on the details. To the praise and glory of His name. Amen! This entry was posted on Tuesday, July 17th, 2018 at 8:06 am and is filed under Colossians. You can follow any responses to this entry through the RSS 2.0 feed. Responses are currently closed, but you can trackback from your own site.